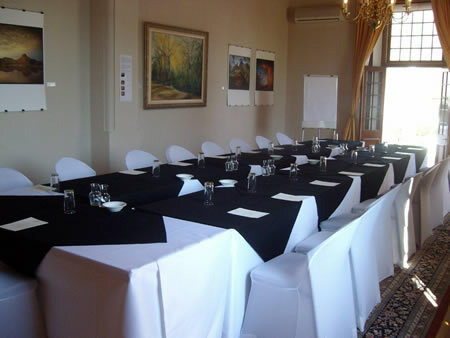 The Lanzerac Hotel is world renowned for hosting high profile events, conferences and weddings. Specializing in catering for your business and entertainment needs, we offer a number of venues specific for your requirements, namely: The Manor House Boardrooms, The Cellar (both equipped with wifi) & idealy located Manor Lawns. Other venues available for small or intimate conferences, weddings or events include the Taphuis Bar, Esquire Bar and Governors Hall Restaurant. Built in 1820 this magnificent example of Cape Dutch Architecture houses 8 bedrooms and 2 meeting or boardrooms. Superb venue for Gala Dinners or Weddings, which can be held inside or in the courtyard. Behind the Manor House lies the large open lawn, with panoramic mountain views, which can accommodate Weddings of up to 200 people, under Marquis.